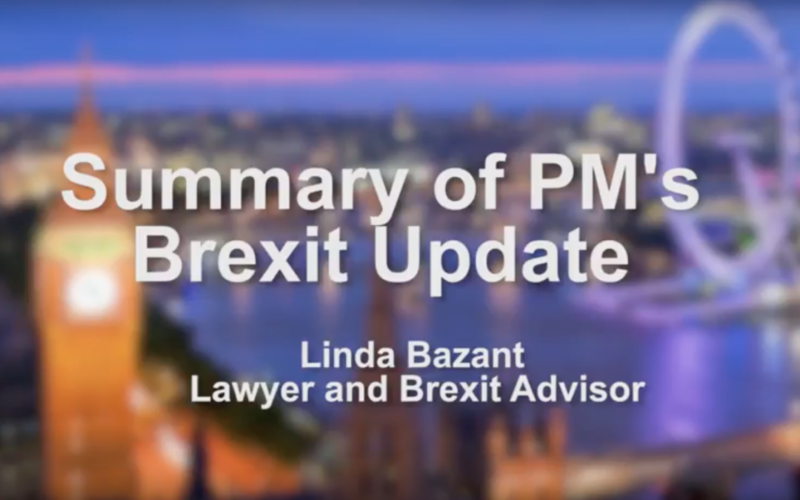 A summary of the recent speech by the UK PM Theresa May with Linda Bazant Brexit Advisor and consultant. On The Single Market: The prime minister does not want Britain to stay in the single market. Instead of membership of the single market, Britain will seek “the greatest possible access to it through a new, comprehensive, bold and ambitious free trade agreement”. The Customs Union is the EU’s common trading area: goods from outside the area are charged a common external tariff to cross its border and enter it; goods already within it can circulate and cross borders freely. Theresa May has repeatedly said control over Britain’s borders was a priority, and she reiterated that while wanting to continue to attract “the brightest and best to study and work in Britain”, “we will get control over number of people coming to Britain from the EU”. British business has insisted some kind of transitional arrangement with the EU will be essential to avoid the potential economic disaster of a “cliff-edge” at the end of the two-year article 50 talks, with no future relationship defined. Some kind of payment into the EU’s budget might have to be part of whatever future trade deal the government negotiates with the EU. May is apparently still determined to kick off two-year negotiations over Britain’s divorce from the EU by the end of March, although she made no reference to this in her speech on Tuesday. She also stressed that “no deal for Britain is better than a bad deal for Britain”,. So, where does all of this leave us? There are still some hurdles to overcome over the next few months, the Supreme Court ruling on Article 50 late January, Northern Ireland’s current political crisis, the triggering of Article 50 at the end of March to enable us to start negotiations with the EU, the effect of the upcoming elections in France and Germany in 2017 and the Italian election in 2018. But it remains clear that Team UK needs to work together to get the best business deal for all parties and one that we can all work with to continue to ensure that we prosper globally. Now that we have some clarity, businesses are in a better position to make plans for Brexit by re-visiting their strategic and budgetary plans now to ensure readiness for 2019.